Notes: Based on the Princess Maker video game series by Gainax. Seventeen-year-old Yucie can never be taken seriously. How can she, when she's been cursed to be trapped in a ten-year-old's body? Bright, cheerful and optimistic, Yucie has never let her curse get in the way of living a happy life with her doting adopted father (a retired knight). However, Yucie's life is about to change forever when she becomes a candidate to become the Platina Princess, an honor which will allow her ultimate wish to be granted - and she can wish her curse away! Everything's turning up roses until she finds out that she is one of many candidates, and the competition is intense! Maybe because I'm a Daddy's Girl, but this anime is one of the first in a long time that managed to hit me right where it counts. The main point of the series is about Yucie and her road to attaining the Eternal Tiara to wish off her curse. In order to become a candidate, however, Yucie must enroll in a school to acquire proper training. During her time in the school, she meets four other girls who are also contenders for the Platina Princess title. There are rivalries, most naturally, and challenges the girls must face every day. But these challenges aren't your typical run-of-the-mill tests of wit and courage ... they're tests of integrity, character, and warmth of heart. Episode by vivid, colorful episode, the girls come closer and closer to reaching their ultimate goal, but when the time comes that the Eternal Tiara is in their grasp, only one girl will get her ultimate wish granted. Whose wish is most worthy of being granted? Is the sacrifice to being the Platina Princess worth it? Will the strong bonds formed between the five girls withstand the final test to be the Platina Princess? The series takes a drastically dark turn (like many of the best anime series out there) towards the final story arc, and the sacrifices the girls make for each other is nothing short of heart-wrenching. Never in my viewing experience have I come across a title that expressed feminine "fraternity," so to speak. 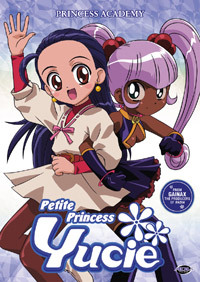 The appeal that Petite Princess Yucie has is no different than the powerful characterization that can be found in such American movie blockbusters such as Saving Private Ryan and Dead Poet's Society, although I can thankfully say that the ending of PPY doesn't have the tragedy for their main characters. If the appeal of what I consider an Ah My Goddess-caliber story doesn't grab you, I can't emphasize enough how stunningly beautiful the animation is for this series. The colors are bright and sharp, the animation is fluid and catchy, and the ending theme, sung by anime favorite Ishida Yoko (Ai Yori Aoshi, among others) is powerfully sweet. This series is entirely underrated, and deserves more attention than what it's getting. At a mere twenty-six episodes, it's time well-spent, and will take you on an emotional sugar-rush that is more than gratifying; it's uplifting, inspiring, and rewarding. Recommended Audience: I believe the video game was meant for a male audience, so fans of the video game will probably be disappointed, because this series is definitely more of the heart-warming sort. It's the kind of anime you'd probably take home to Mom and Dad, a la Ah My Goddess. There are references to heaven and hell, which might offend those who object to straying from traditional views of such (Erumina's father is supposed to be the king of the demon world, et cetera).